Looking for an easy vegetarian recipe to use as a holiday appetizer? 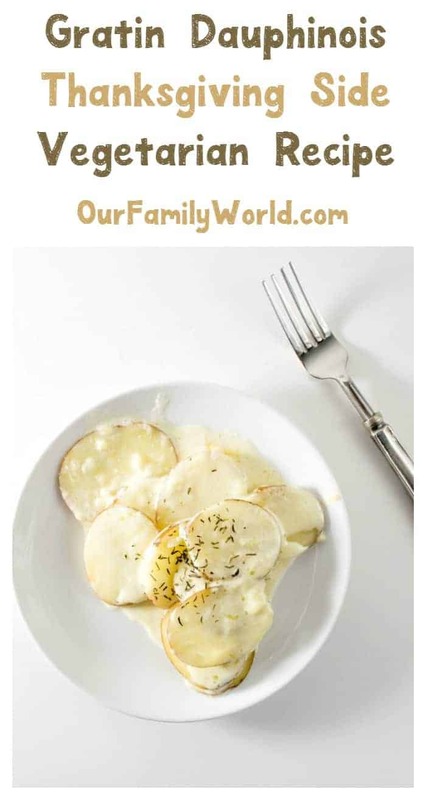 These scalloped potatoes (gratin dauphinois) will make a perfect side dish for any Thanksgiving or Christmas meal! It is delicious, filling (but not too much, unless you eat more than one portion) and budget friendly too! What more can we ask for? Even little hands can help you make it! We could use all the help we can get during the holiday season. My daughter loves peeling the potatoes. Since I boil them beforehand, it is easier for her to peel. I let them cool off a bit before allowing her to do so. I don’t want her to get hurt! Now let’s get to the recipe details. Your guests will be impressed. In a large saucepan , bring water to boil. Add salt. Peel potatoes and slice them about 1/8 inch thick. *It is important that you don’t overcook potatoes or you won’t be able to slice them. You don’t want mashed potatoes, do you? In a small bowl, mix the cream, garlic, nutmeg, 1 cup of cheese. Let is stand for 10 minutes! In a large saucepan, bring water to boil. Add salt. Peel potatoes and slice them about 1/8 inch thick. *It is important that you don't overcook potatoes or you won't be able to slice them. You don't want mashed potatoes, do you? This easy vegetarian recipe will definitely impress your guests! The Gruyère cheese adds such a richness to it! If you need some ideas for main dishes to pair it with, check out a few of my favorites! These are both vegetarian and non-vegetarian options. This Pumpkin Risotto makes a great meal for your vegetarian guests. Just about everyone loves pumpkin this time of year! You can also choose from one of these 5 Super Delicious Kid-Friendly Vegetarian Meals For Large Families. If you want to go the traditional route but still add a bit of flare to your meal, your non-vegetarian guests will definitely love our Turkey with Bacon, Walnuts and Dried Cranberries Stuffing Recipe! Our Grilled Butter Chicken Pork Chops are also a great option for meat lovers! Do you have a favorite easy vegetarian recipe that makes an awesome Thanksgiving side dish? Share in the comments! Does Gluten Affect Weight Loss? 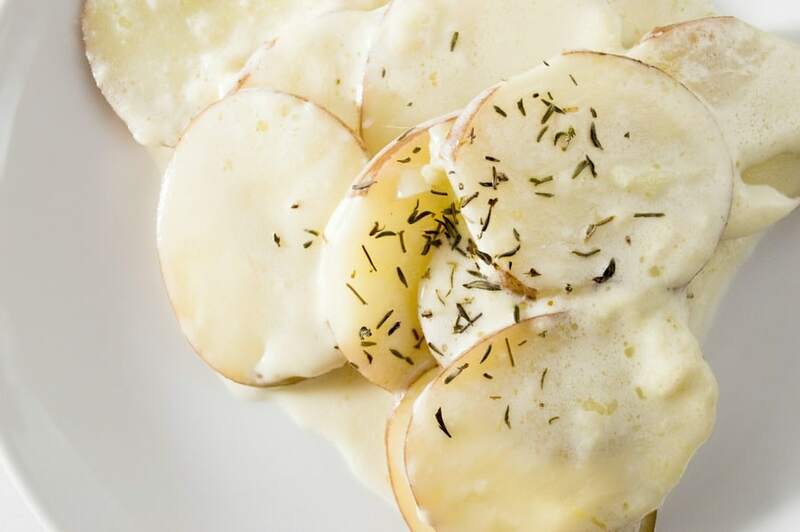 I love your gratin potato recipe and will be trying that.It looks so rich and creamy tasting.Thank you for all of these wonderful looking recipes.They look delicious. I cannot believe Thanksgiving is just around the corner! I love going outside the box and creating new dishes each year, and these look perfect! These look so creamy and delicious! I need to try these for thanksgiving for sure, it will be a hit for all of my guests. That sounds and looks like a great potato dish! I’d definitely try this as a side dish not just for Thanksgiving, but for any potato side dish! I’ve never thought to use this type of cheese for my Au gratin potatoes! I definitely want to try this and see how yummy they are! Thanks for sharing such a great recipe! 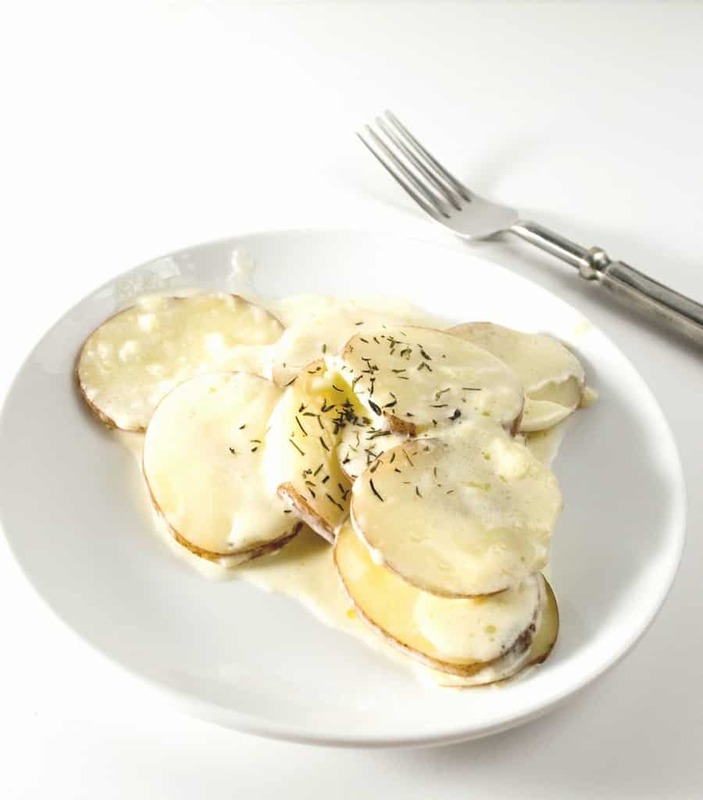 This recipe brings back such wonderful memories of my Daddy making potatoes au gratin. He would do them on an dish in the oven and I would watch through the window as the cheese bubbled over them. We just had Thanksgiving here in Canada over the weekend and it was lovely. Wish I would have seen this before, would have loved to have made these! It looks so gorgeous! So perfect for holidays! Definitely a must have on our holiday menu! I love potatoes and it’s always great to learn new recipes that have it. I think this is worth a try and I’m sure my kids will like it as well. Thanks! That sounds delicious! I love finding new ways to make potatoes for holiday dinners. Oh this is so perfect. I like having a couple of vegetarian options for the big meal. These sound great! I am always looking for Vegetarian options to make. This Pumpkin Risotto looks so delicious and easy to make. I can not wait to try it. My daughter avoids meat most of the time. That pumpkin risotto would be her perfect Thanksgiving meal, but she would love this potato dish too. Gratin potatoes are so delicious, one of my favorite thanksgiving sides. These both look like yummy side dishes. I am always looking for new recipes for Thanksgiving dinner. Thank you for sharing the recipes. Oh wow, this looks delicious! My mouth is watering! Thanks for sharing! Those potatoes sound amazing! I’ve had au gratin potatoes, but never like that before. I can’t wait to give these a try. Yum! Oh wow. That looks so good! I think I’ll make those for our Thanksgiving this year. Mashed potatoes have gotten so boring.